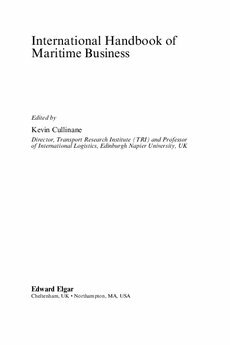 This chapter suggests a knowledge management system as a strategic option for maritime transport (that is, shipping and port) operators to improve maritime logistics value. Maritime logistics value refers to the extent to which maritime transport operators meet logistical demand, for example through the efficient and effective fl ow of physical goods, service and information. If maritime transport operators satisfy customers in logistics and achieve logistical goals, the value of maritime logistics becomes greater. Important requirements for maritime logistics value are operational efficiency (for example, reducing lead time and business costs) and service effectiveness (for example, flexibility and reliability in the service). We hereafter attempt to suggest a new strategic option for maritime transport operators, who also face a volatile business environment, to fulfil the logistical demands and enhance logistics value. Relevant issues are discussed from a strategic management perspective. A knowledge-based approach is well accepted by strategic management scholars when exploring the competitiveness of a firm in a highly uncertain environment, with the knowledge-based benefits recognised as innovation, uniqueness, productivity, service quality and so on. We aim to apply a knowledge management system for maritime logistics value and seek a useful solution for decision makers in maritime business. The next section considers an overview of knowledge management and its importance in maritime logistics value. A conceptual framework is established by embracing associated literature including knowledge management, social network embeddedness, and maritime logistics value. This is followed by an exploratory case study, which leads to three propositions that have strategic implications for maritime transport operators.